In the 1860s, when population growth in the mountain areas around Boulder began to boom thanks to the new gold camps, discouraged miners left the mountains to settle into farming areas along creeks like the St. Vrain. The area near present-day Lyons had ideal farming conditions and in 1880, Connecticut native Edward S. Lyon settled there. He returned east to sell shares of his 160 acres of durable, salmon-red sandstone, which was in high demand for building at the time, and two years later, the town was platted. In 1881, Lyons officially became a town when Thomas G. Putman bought and resurveyed the area. The town built its first main building that same year. It was a red sandstone schoolhouse, which is the Lyons Redstone Museum today. In the early 1900s, cement began to replace sandstone as a building material and the town’s population dropped to half its size. It wasn’t until the 1960s that Lyons brought new residents, particularly commuters, as employment opportunities grew in neighboring cities such as Boulder and Longmont. Today, Lyons is referred to as the “Double Gateway to the Rockies,” and is known for its unique art, major folk and bluegrass music festivals, and mountain recreation. Since 1912, Longmont Power & Communications has owned and operated the 500 kW hydroelectric plant located just west of Lyons. The plant is one of the first public power projects in Colorado, and it continues to serve its original purpose today. Each year the plant helps offset up to $173,000 in purchased power costs, benefitting local customers. In 1987, the U.S. Department of the Interior entered the Longmont Hydroelectric Plant on the National Register of Historic Places and on Jan. 5, 2012, reached its first century in full operation. 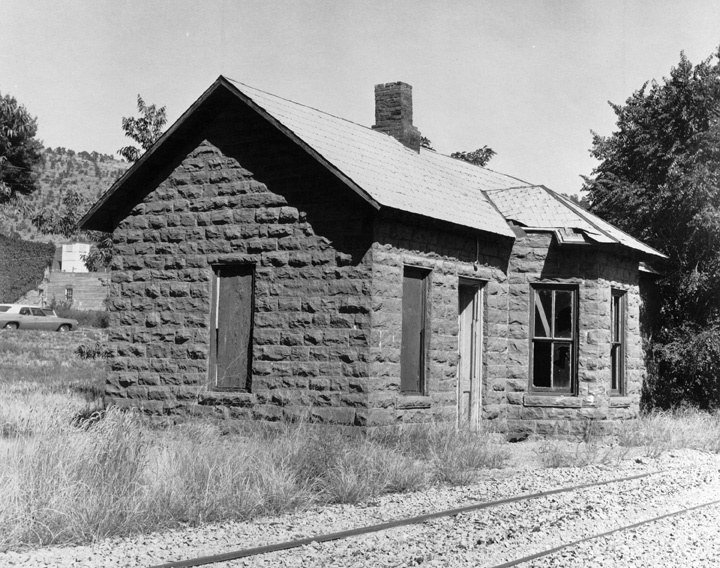 Longmont contractor Mark Boyd built the Lyons Railroad Depot in 1885 utilizing native Lyons sandstone. Used first by the narrow gauge Denver, Utah and Pacific Railroad, the depot served passengers and freight until declining traffic brought its closure in the 1940s. A recent addition to the depot facilitates its use as a library. The community pooled efforts in the late 1970s to transform the abandoned building into the Lyons Depot Library. Graffiti over 100 years old was discovered behind boarded walls. An interior sandstone wall near the checkout desk show the marks of the masons’ tools. Functional historic rolling doors allowed for special indoor-outdoor programs. The Longmont Pioneer Museum returned the original station identification sign which was placed inside. Powerful flood waters destroyed many homes and severely damaged roads and buildings, including the Lyons Depot Library on Sept. 12, 2013. Many library materials were destroyed and everything else was placed in a storage pod for safekeeping. As renovations continue at the Depot building, the library moved to a storefront on Main Street. in 2014. The Depot is currently being carefully repaired, preserving its historic designation. At some point, the Depot will once again be the library’s home. 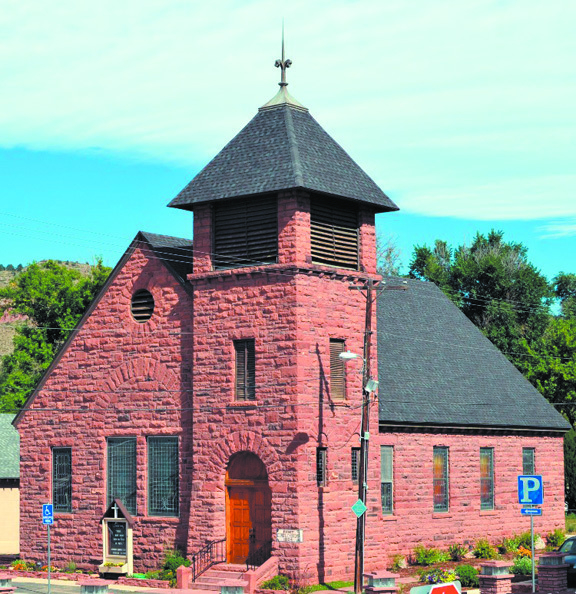 Lyons has a Designated Historic District, with 15 sandstone structures—including many on Seward, Main and High streets—which are listed in the National Register of Historic Places. These were all constructed of native stone by master craftsmen between the early 1870s and 1917. They include commercial, residential and public buildings. Architects and builders employed Lyons sandstone because of its quality and distinctive red color. Masons used the stone in structures across Colorado, and it was exported as far east as Chicago and New York. Built in 1933, the shelter’s design is typical of WPA construction. It was constructed with water, sand, and rocks from the nearby river; timber and sheeting from area lumber mills; and labor supplied by the workers of Lyons. 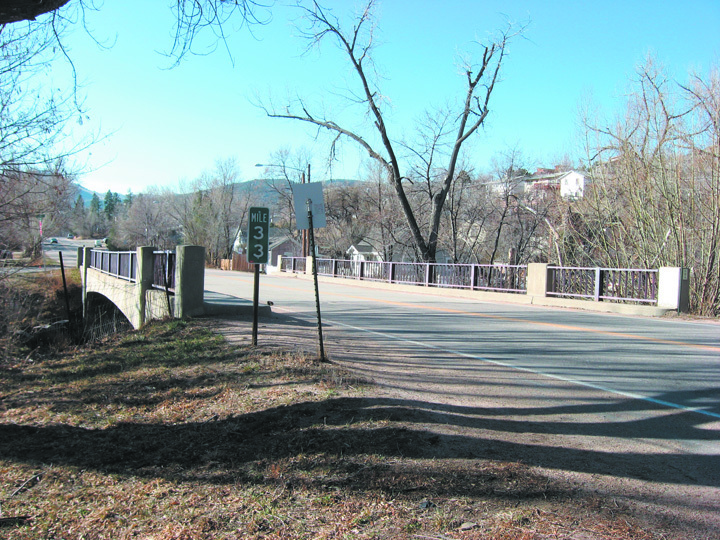 The 60-foot long single span concrete rigid frame structure crosses North St. Vrain Creek at the southern edge of Lyons. Constructed in 1955 by Lowdermilk Brothers, from a design by the U.S. Bureau of Public Roads, the essentially unaltered bridge serves as an important component along the major access route to Roosevelt National Forest. Tags: Longmont Power Plant, Lyons, Lyons Railroad Depot, Lyons Sandstone Buildings, Meadow Park Shelter House, North St. Vrain Creek Bridge, Old Stone Church. Bookmark the permalink.